Today the old Redlake Railway track provides an eight mile picturesque walk up into the southern wilderness of Dartmoor. With wide ranging views and peace and quite virtually guaranteed it makes for a splendid day out. As the old track winds its way up to the moor there are the odd tell-tale signs of some previous industrial activity until eventually the ‘Volcano’ of Redlake loom up out of the landscape. However, some one hundred years ago things would have been very different with the hustle and clamour of a busy industrial site along with all its trappings. Below is an account of the railway and its associated china clay works way back in 1912 just as the project was nearing completion. “Now, if you go along the Abbot’s Way – trodden by the monks of old in their journeys from the Abbey of Tavistock to that of Buckfastleigh – as you come within reach of the boggy region between the Erme and the Plym you are very likely to see the white steam from a locomotive floating across the hills, and as you reach the edge of the basin which is called Redlake (or Reed Lake) you will happen on numerous signs of human activity. The deepest solitude of Dartmoor has been pierced by the industrial spirit. Here, upon the roof of Devonshire, china clay has been discovered in vast quantities, and is about to be exploited. High above our heads (for White Barrows Hill, close by, is 1,575 feet above sea level) buildings of stone and wood and of corrugated iron are being put in, huge pumps are working, excavations are being made. There is a buzz of wheels and a trundling of trucks and barrows, a plying of picks, and the middle of the morass of Redlake presents the appearance of a slowly settled township in the midst of the prairie. Underneath the enormous deposits of peat are great stores of wealth in the form of kaolin or china clay, the result of the decomposition of that granite which is the very matter of the hills themselves. A large area of the moor has been leased from the Duchy by the China Clay Corporation, Ltd., and active operations are in progress. A great deal of preliminary work has been done, the most striking part of which, to a lay spectator, is the construction of a narrow gauge railway, over eight miles long, from Bittaford, on the main line of the G.W.R. between Ivybridge and Wrangaton, to the heart of the clay works themselves. It is a most interesting and admirable piece of work, which was designed by Mr. R. Hansford Worth, the engineer of the company. The Great Western Railway has constructed at a point where the narrow gauge line joins it system extensive sidings for the accommodation of the clay traffic, and alongside this the company has constructed its first dry, a substantial building of the form familiar to travellers along the Cornish railway in the neighbourhood of St. Austell. Behind the dry are the settling tanks. Alongside, an inclined railway, worked with cables, leads to the level of the company’s line on the moor far above, where on the occasion of a recent visit, the locomotive C. A. Hanson, named after the chairman of the company, stood with steam up and a little saloon carriage attached awaiting the arrival of the party. The journey of eight miles through some of the wildest scenery of Dartmoor is extremely interesting. 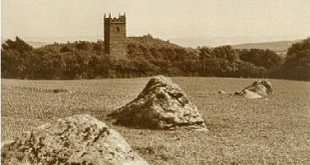 The line winds up the slopes of the hills above the valley of the Erme, which plunges through deep gorges in places, and on every side are the vast expanses of down land, broken by the characteristically rigged tors of Dartmoor. The line pursues its serpentine course along easy gradients for the main part, turning aside here and there to dodge some prehistoric hut circle ( for all the ancient remains upon the moor have been piously respected by the Corporation and its officers in accordance with the undertaking given). The cutting of the line has revealed in certain places the enormous wealth of peat which exists upon the moor. To get at the solid ground it has been necessary to cut down to a depth of ten, fifteen, or twenty feet through rich, black deposits, and one could not help speculating as to whether all the largess of Nature might not some day or other be turned to commercial uses. Whistling cattle and sheep out of the way, and puffing steadily over higher and higher, the C. A. Hanson at last brought its car to rest amid the scene of industrial activity already sketched. Along the route not far from the railway, parties of contractors’ men were seen at work in various places upon the construction of the pipeline, which is one of the most important appurtenances of the clay works. This conduit consists of a double line of nine-inch pipes. It is eight miles in length, and it conducts the clay in a liquid state, or rather a state of solution, from the concentrating pits at White Burrows to the settling tanks at Bittaford. At Redlake the shaft, at the bottom of which liquid clay will be collected for transmission, was in active course of construction, and it reached a considerable depth. Alongside, the engine pit was being laid. Powerful pumps will force the clay from this point through a fifteen-inch steel tube, seven eights of a mile long, to the concentrating pits, which are situated at the top of the hill. After the long journey of eight miles to the Bittaford tanks, the clay settles there, and is cut out and transferred to the dry, where it assumes its commercial form. The liquid residue passes on below the Great Western railway to two clarifiers, each seventy-two by twenty-five feet, where it will be so treated that the effluent passing into the River Erme below will be as clear as crystal, and no evidence will be left in the stream of the existence of clay works on the moor above. A few statistical details of the work so far done and proposed to be undertaken may be added. At Redlake the average overburden is a present about 11ft., composed of 5 ft. of peat and 6ft of subsoil under the peat. The size of shaft is 10ft. 6in. by 7ft. 6in. by 130ft. deep, and the column in the shaft through which the clay in solution is pumped is 15in. in diameter, and connects on top of the shaft to a 15in. Mannesmann steel tube, which is the rising main. It rises 74ft., and is 4,122ft. long. The clay after being pumped through falls into a tumbling bay and is immediately distributed through the micas, which are 335ft. long and 43ft. 5in. wide. The micas have a concrete bottom covered with a wood floor and longitudinally divided by 11in. by 1.5in. boards placed on edge, 15in. centre to centre. The usual traps, about 50ft. apart, are provided for extracting the mica from the clay. After the clay has passed over the micas it flows into No, 1 concetrator, of which there are four, size 37ft. 10in. by 38ft. 9in. by 13ft. depth at centre outlet. From No. 1 the clay flows to No. 2 concentrator, of which there are six, size 52ft. by 52ft. by 12ft. 6 in. depth at centre outlet. There are also mica pits 52ft. by 52ft. by 12ft. 6in. The bottoms of the concetrators are shaped like an inverted pyramid. A considerable portion of water is taken off after the clay has settled a little in the concentrators, and is sent back to the clay bottoms in a return leat, which is 1.5 miles long. This leat catches any polluted water from the micas, and therefore prevents the River Erme or Avon in any way being discoloured. From the concentrators to the tanks and kilns at Bittaford, a distance of nearly 8 miles, a double line of 9in. diameter stoneware pipes is laid in a track 4ft. 3in. deep fro conveying the clay in solution. The pipes have a gradient the whole of the way, the fall from the concentrators to then tanks being over 1,000ft.. Manholes are provided every 1,00ft. run, and a telephone cable is laid in the length. At Bittaford, No. 1 dry is complete. It has six tanks, 11ft. 6in. by 43ft. 4in. by 8ft. deep. The drying pan is 268ft. long, and is capable of drying about 16,000 tons a year. The linhay which abuts on the siding is capable of holding 2,000 tons of dry clay. The siding is 1,620ft. long, and the loading bank, built for taking cask clay, etc. is 570ft. long by 15ft. 6in. wide. A stack is erected 90ft. high, and will be used both for the kiln that is finished and No. 2 kiln which is in course of erection. The Corporation’s railway is 3ft. gauge, over 9 miles in length, and has oak sleepers 7ft. by 3.5in., placed at 2ft., centre to centre. The rails are 41.25ins. per yard and secured with fang bolts and dog spikes. The incline for connecting the G.W.R. with the railway on the moor is 2,000ft. long and rises 1 in 5. Materials are hauled up by a winding engine and wire rope. The railway stock includes two locomotives, 3 passenger coaches, 12 goods trucks, and 2 timber bogies.” – The Western Daily Mercury, July 20th, 1912.